Lindamente remodelado e mobilado estúdio apartamento no bairro histórico e maravilhosamente eclética o Travis Heights. Nova casa de banho com bancada de Corian, piso de cerâmica, box de vidro sem aro e espelho. Tábua e ferro em cima do pedido. - Boardwalk em Ladybird Lake está a poucos quarteirões de distância. - Os pontos de ônibus localizados em Riverside Drive. - A uma curta distância para SoCo (0,75 mi.) E Downtown Austin (1. 5 mi.). - O imóvel está localizado em área urbana. - Locais de música ao vivo nas proximidades. Laura and Raymond are very helpful hosts, and the studio is absolutely lovely. Private, clean, great light and ... my favorite ... just across the road from the hike/bike path around Lady Bird Lake. Great for early morning runs, or walking to see the bats come out from under the Congress St bridge at sunset. This apartment is situated in the middle of a beautiful treed property, with a pond and decking. When we were in the apartment, my son said he would move to Austin to live if he could find as nice a place to live. Laura was wonderful in meeting us and helping us get the lay of the nearby land, restaurants, etc. I would stay there again. Wonderful hospitality, comfortable home, great location! We had a great stay at Laura's place in Austin. The home was very comfortable, nicely decorated, with all the necessary details provided for. 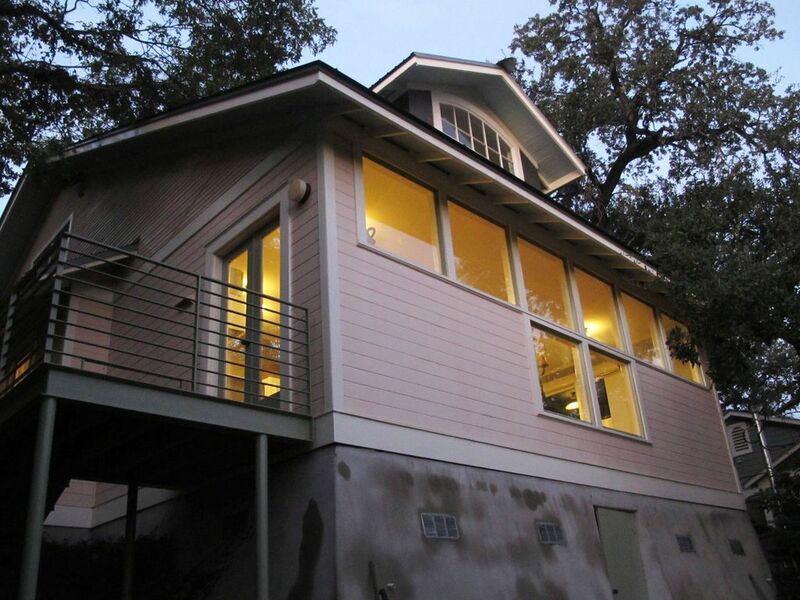 The location was perfect for what we needed, within close proximity to downtown, So Congress and Zilker Park. Communication in advance of the trip was great, with directions and local information shared in abundance. Thanks very much for the special hospitality... we look forward to the possibility of staying again sometime in the future. We stayed for a long weekend (Thurs - Sun) to explore the city. Laura and Raymond were wonderful hosts for my birthday trip to Austin. Not only were there snacks and drinks in the fridge, they'd picked up a happy birthday cake, candle and hand painted a card! The location was centrally located and perfect for exploring the city. Beautiful, historic neighborhood right outside the city. We had an amazing time and will be back soon. Thank you! Great location, clean and the owners were amazing! What a great find for our all too brief trip to Austin! We drove from Northern California to Austin for a motorcycle show and rolled into town a day early. When I contacted Laura about the possibility of staying that night she said absolutely! When we arrived, she was waiting for us and showed us the beautiful apartment and left us with many goodies in the fridge! I can't say how we appreciated the cold drinks and snacks that evening after no dinner and 12 hours in the car! The apartment itself is clean and super comfortable and the owners have thought of everything to make your stay a great one. Did I mention that you are walking distance of downtown and South Congress, as well as the river walk area? There was one really bad part of our stay; the day we had to pack up and leave this peaceful, historical property. O imóvel está a uma curta distância de muitos locais de música ao vivo, locais de festival, restaurantes, remo, stand-up paddleboarding, caiaque, canoagem, Ladybird Lake calçadão, lojas, teatros, cinemas, etc. De manhã você pode caminhar para Joe em South Congress, tomar um café com pastelaria, ler o jornal, e observar as pessoas. Ou você pode ir para uma caminhada ou passeio de bicicleta no calçadão. A entrada é blocos de dois e meio a partir do estúdio. Você pode nadar durante todo o ano para livre em piscina Big Stacy. No inverno, a piscina é alimentada com água quente natural e é um 30 minutos a pé a sul do estúdio. Piscina para crianças e quadras de tênis das crianças estão na extremidade norte do parque e apenas a dez minutos a pé. Há uma paragem de autocarro em frente ao estúdio que pode levá-lo diretamente para o Capitólio para um passeio ou um piquenique no local. Uma rápida caminhada para o leste o levará para uma pá de aluguer de placa stand-up que tem iluminado a partir das placas de fundo. O que uma ótima maneira de ver Austin por noite. CANCELLATION POLICY 100% refund at least 30 days before arrival date.